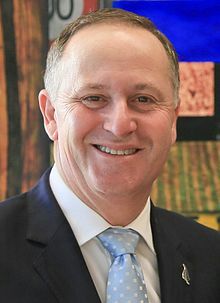 John Phillip Key (born 9 August 1961) is a New Zealand politeecian, an a member o the kintra’s pairlament in Wellington, representin the Naitional Pairty. He is a consteetuency member unner the proportional representation seestem, representin Helensville. He wis Prime meenister o New Zealand frae 19 November 2008 (succeedin Helen Clark) until 12 December 2016, when he wis succeedit bi Bill English, efter annooncin his demission. He was re-electit as Prime meenister in 2011 an 2014. Wikimedia Commons haes media relatit tae John Key. ↑ "Official Count Results–Helensville". New Zealand Electoral Commission. 12 November 2008. Retrieved 12 November 2008. This page wis last eeditit on 12 Dizember 2016, at 19:58.